I have been reading a lot of messages from players on my Twitter account and there seems to be a few misconceptions out there about the composition of our community, the effect of bots on player concurrency and what apparently constitutes the average player. I thought I would address all of these for the benefit of everyone in this dev blog. 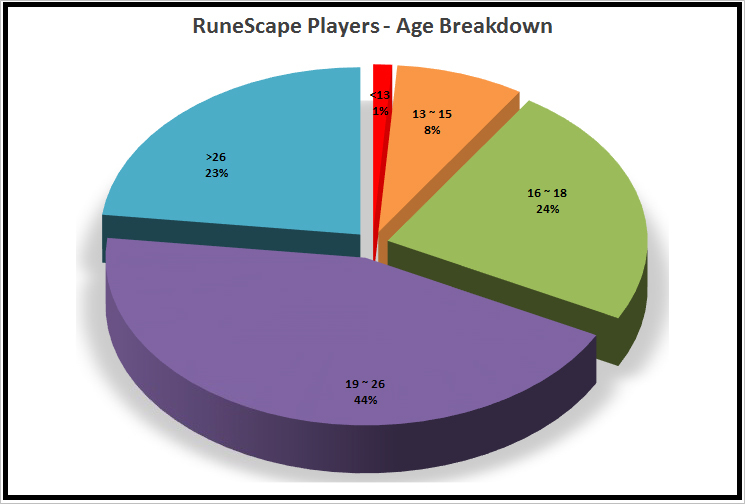 Our community is composed of 84% Men and 16% Women players and 90% play RuneScape in English (Gender & Age statistics based on a world wide survey we commissioned of tens of thousands of players). So what does the ‘average’ RuneScape Player look like? And despite rumours that everyone in RuneScape is very rich, the truth is only 1% of players have over 1 Billion GP in total wealth. Pre-bot nuke, we had 200k dodgy accounts getting into the game every day and botting until banned, at the time it would take several weeks and multiple player reports before being banned. We absolutely smashed that with bot nuke in 2011 – 95% disappeared overnight. Bot developers adapted though and within a year they were back up to their old volumes. These new accounts found themselves in a much harsher environment though, battling our latest in-game tech which was banning them ever-quicker than before. Since 2013 we brought a range of next generation anti-botting technology allowing us to detect all bots within hours with 100% certainty. We ban bots at random intervals a few days after first detection so that they never know exactly how they were detected. A side effect of this is that we see many players who had botted prior, try to appeal their bans as they incorrectly believe they were unfairly banned because they are often playing normally when the ban is applied and therefore think we’ve made a mistake and somehow they managed to get away with historic botting. Bots cannot adapt to this new technology leaving them flawed and at a completely manageable trickle. Finally in September 2013 we began focusing on wiping out Gold Farmers, by introducing Bonds. This, along with constant updating of BotWatch, has kept ‘dodgy activity’ at record low levels, in fact rock bottom in the main game. Happily, the volume of bots and gold farmers is lower than ever however we are not complacent and with the success on the main game we are now working on extending our focus to Old School RuneScape. Gold farmers typically run bots 24 hours a day, 7 days a week. To put that into perspective, our most fanatical top three players on the high scores #1 ‘S U O M I’ plays an average of 07:27.00 hours a day, #2 ‘Drumgun’ plays on average 13:06.00 and lastly #3 ‘Jake’ plays an average of 12:48.00 per day. The average player however only plays just on 2 hours a day in the week and an additional 32 minutes on average on the weekend. So, with this in mind a single goldfarmer bot used on a weekday would represent the equivalent of 12 ‘real’ players on the “players online now” count and therefore for the first time in a decade our active players represents our true “Players Online Now” numbers. We also recognise the transition to Evolution of Combat was too big a change for some, and we sadly lost some of our community with the update. However, we are making huge strides to now give players the choice as to which combat system they would prefer with the introduction of Revolution and the work currently being undertaken on ‘Legacy Mode’, which will bring back much of the old combat gameplay and interfaces, in the main game alongside Evolution of Combat. Thankfully we did see a lot of these lapsed players return to Old School RuneScape instead. Net result? 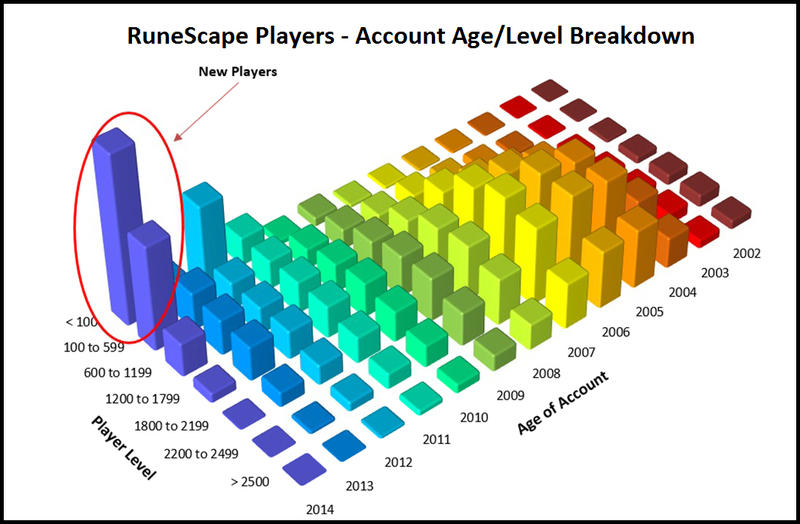 Concurrent players is as high over recent months as it was a year prior, with more players returning to RuneScape and thousands of new players joining our amazing community than at any time in the last year. We’ve even seen counter seasonal positive growth the past quarter. RuneScape is a game and a social network, for me it’s always been about hanging out with friends, old and new. If you have old friends who may have left this is a great year for them to come back. Join the conversation on twitter: @RuneScape. But unfortunaly you are selling xp and that has caused me and many many others to stop playing the game. I will wait for the day you stop selling xp and will happily start playing again. "So, with this in mind a single goldfarmer bot used on a weekday would represent the equivalent of 12 ‘real’ players on the “players online now* count and therefore for the first time in a decade our active players represents our true “Players Online Now* numbers." True, and it's been an argument for a long time. Are players really coming back? It's hard for us to see over the grand scale, but two old friends from my '07 clan just logged in osrs and one in eoc. 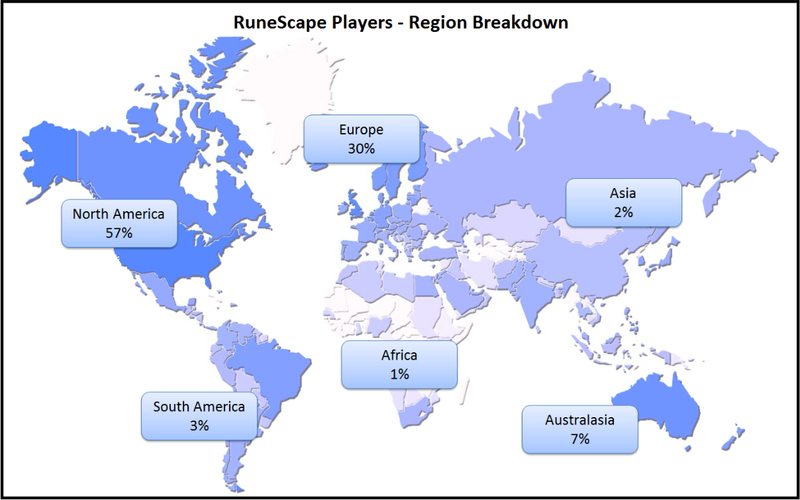 Our community is composed of 84% Men and 16% Women players and 90% play RuneScape in English. how do you get this information? survey?